I did it. I made a tree skirt. It didn't turn out quite like I expected. Actually, I didn't set out to make a tree skirt at all. It...happened. All because Jo-Ann Fabric didn't have what I wanted. 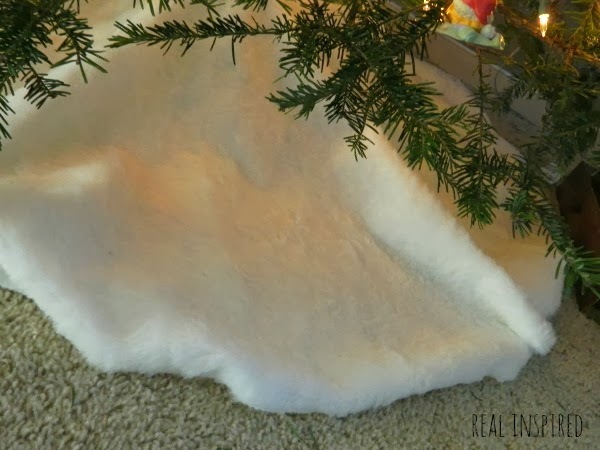 I originally wanted to make a few faux sheepskin rugs to lay under the tree. I figured I could use them throughout the year anywhere that needed a little sheepskin love. Which if you remember this post, is EVERYWHERE! Well, when I got to Jo-Ann's, they had white grizzly bear fur and this stuff. The bear fur was pretty and I liked the fur length, but no matter how I looked at it, it definitely still looked like a bear. Or a wolf. Which is great but wasn't what I wanted. So I went with the shorter and cheaper fur. I had no idea when I went in, but all the fake fur was on sale 40% or 50% off. I can't remember which. I just know I was a happy camper when I saw how much I saved. 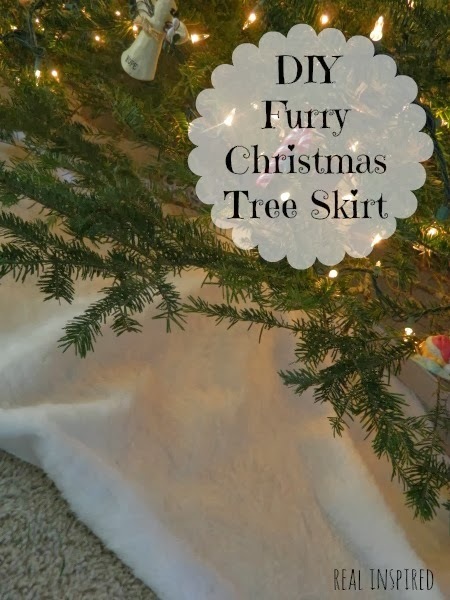 I followed this tutorial for cutting out the tree skirt shape. Basically, fold your material in fourths, inside out. Hold one end of your measuring tape at the corner and swing the other end from one side to the other, marking a semi-circle with your fabric chalk or marker for the width, and then a smaller semi-circle for the tree hole. 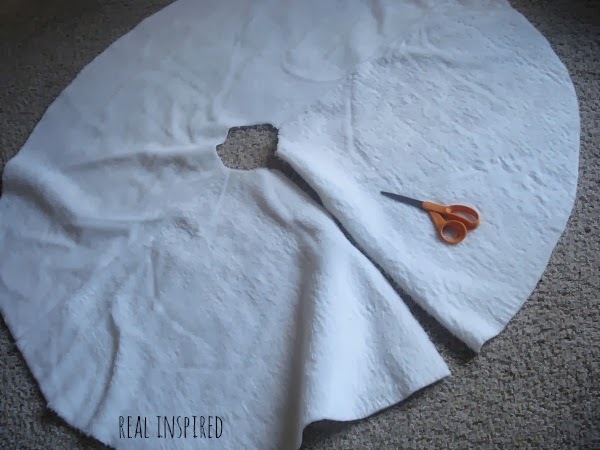 Unfold it and cut one line all the way up to the small hole so you can wrap it around your tree. 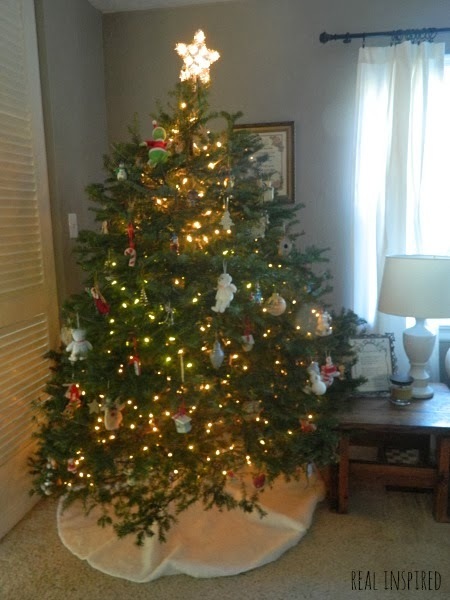 I made the semi-circle 27" from the corner and the semi-circle for the tree opening 3.5". I used a yard and a half of material and 27" was as big as I could get it. You could get two yards of fabric if you wanted a wider skirt. A quick warning: this stuff sheds. I bought this stuff wearing a black wool coat and I was covered with white fluff before I even left the store. It was worse at home. Anyone beside me watch British dramas? Those cotton factory scenes in North and South? White fluff floating everywhere? Imagine me in those scenes. Except in my maternity yoga pants and Hubby's large t-shirt. And way worse lighting. To stop the shedding madness, I sewed a zig-zag type stitch around the very edge. 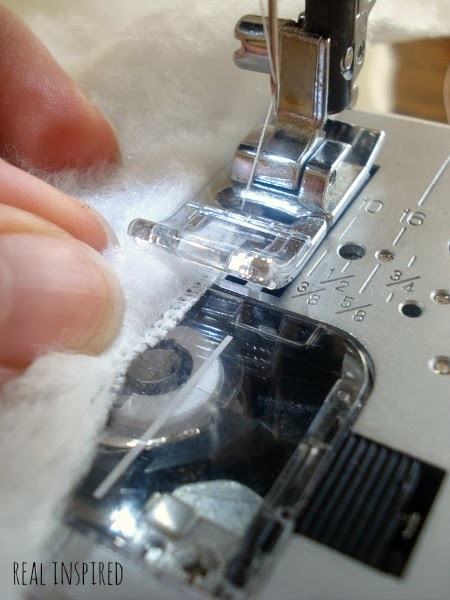 As I went, I pulled the fur back from the edge, hoping that the fur would be long enough to cover the stitch when was I was done. I tried turning the edge under to make a small hem but I only sewed about four inches when I realized that it looked a whole lot sillier that way. So I called it a day, ripped out that stitch, and deemed this project done. When I put it under the tree, I casually fold it under a bit to hide the edge. Even so, the edge really isn't that noticeable. The fur kinda falls over it in some places and when you're walking around you're not looking at it anyway. Way easier than I expected it would be. And now we have our first Christmas tree skirt! I love it. Even if I hadn't originally planned it. And so much furry texture! I have most of my Christmas decorations up now. I started late so I still have a few more things to make. How about you?